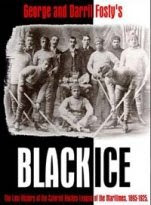 It is a pretty interesting book about one of the least known group of hockey players ever. The maritime league was an all black league featuring back when black hockey players were never heard of. George Fosty was a guest on CBC radio's Sportology recently. Here's the link to the short audio podcast. Just found this site the other day. Love it.